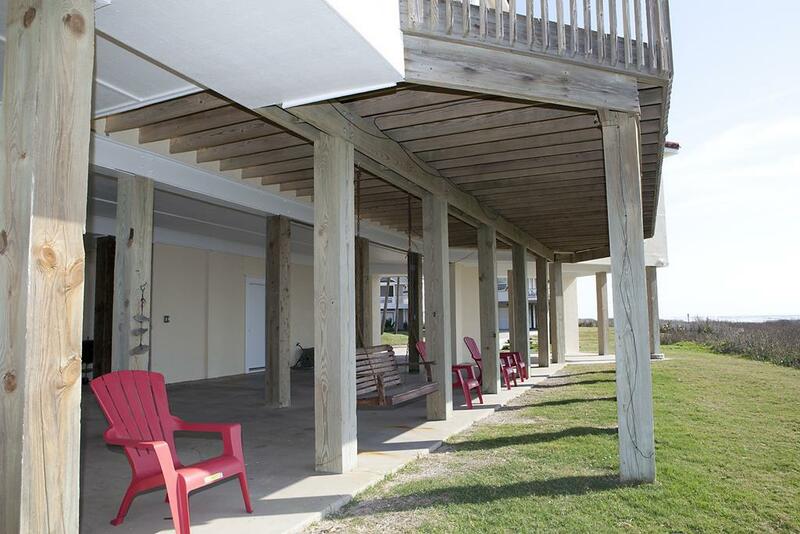 Bright & spacious beachfront, 2 master suites & a huge deck! 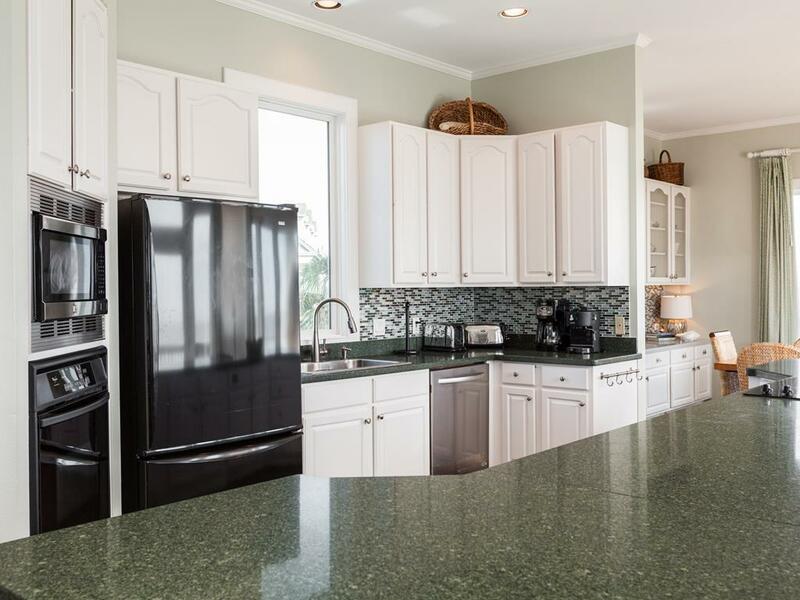 The contemporary interior boasts an updated kitchen, large dining area, and open living area – all with Gulf views! 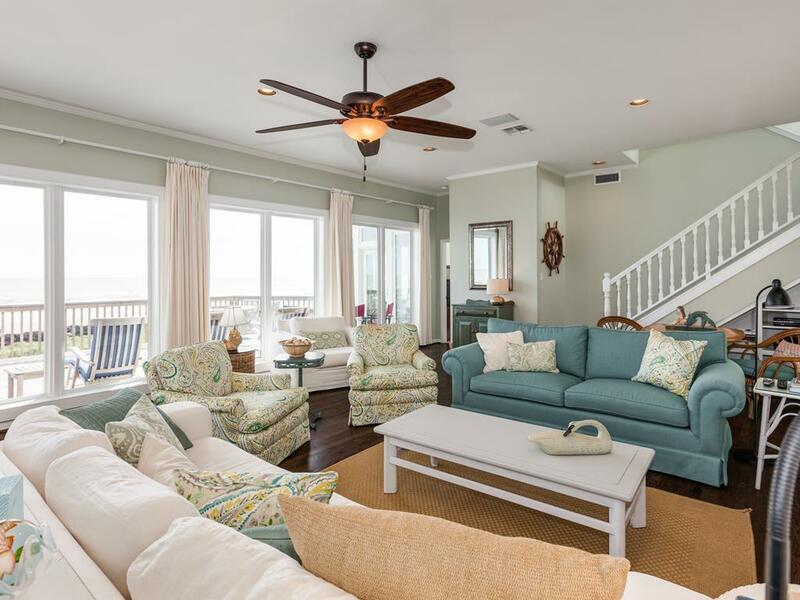 You’ll appreciate abundant outdoor seating and dining space on the large deck. 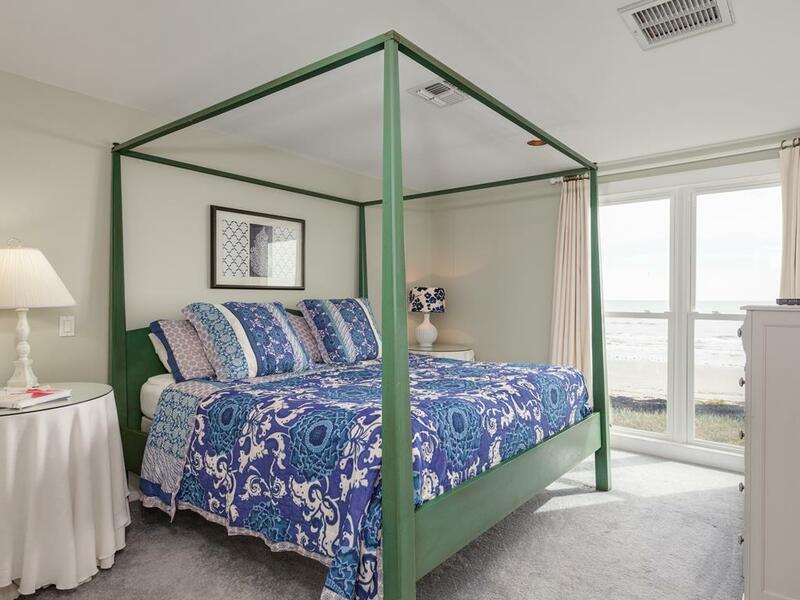 Each large bedroom has a private en suite bath, and three of them also have views of the beach. This house has a strict NO PETS restriction due to medical reasons. No exceptions! 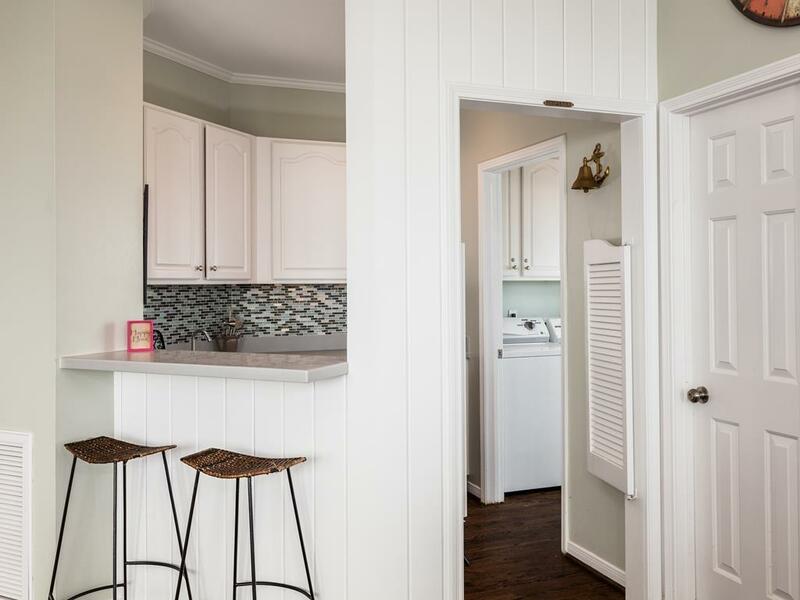 NOTES: Check the amenity list to see all amenities for this property. This house has a strict NO PETS restriction due to medical reasons. No exceptions! We stayed in Nov. and everyone was hot while sleeping even though we had the air conditioner set on 67 or 68. The next night we set on 65 and left the bedroom doors open and cooling was better. This house might need to have freon checked. Also there are no ceiling fans. There was a box fan in the bunk room. Loved all the windows. The common areas had great open space for lots of family and friends. Beach was so close was convenient to walk out at any time for even short moments. very comfortable home with good floor plan and comfortable furnishings. Location on the beach is ideal. we have been renting this property for six years. This is the perfect place to enjoy the beach! We love the house so much with its views and it's so comfortable and feels like home to us!! This is our third summer to rent it and our entire family loves it! 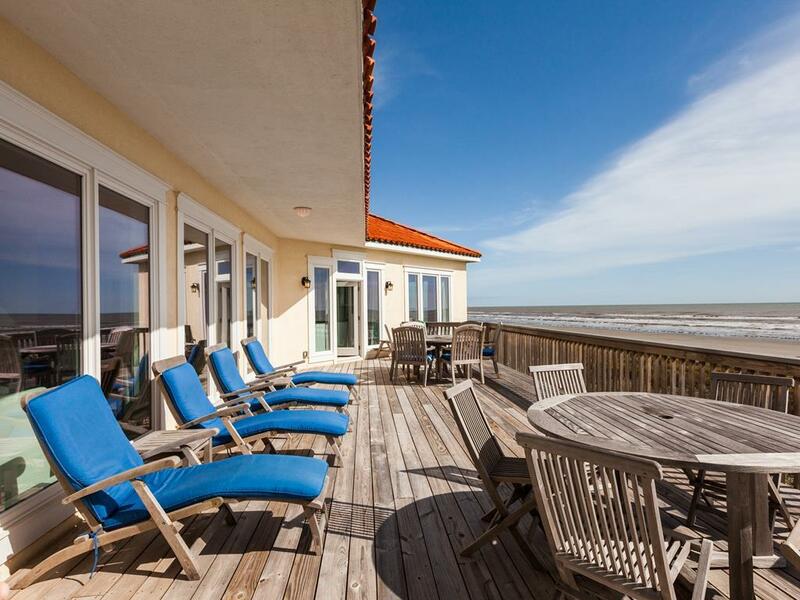 iBeach is a lovely property with fantastic views and comfortable furnishings. Our family enjoyed our weekend tremendously. A few suggestions-- make sure to bring beach towels as the home only comes with 1 face, 1 hand, and 1 bath towel per person. Also, bring coffee filters (cone type--none on site) and extra trash bags (again, only 2 kitchen sized bags were left at the home -- not enough for our large group). We loved the house and our time on the beach! 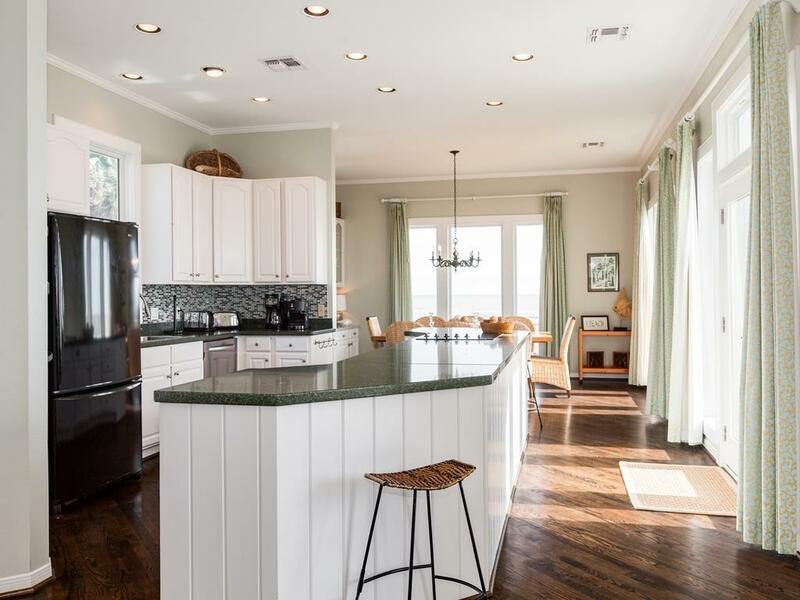 This is a wonderful home with a short walk to the beach. All beds are really comfortable except upstairs king bed which is Very rickety and hard. Our family had a wonderful vacation and really enjoyed the fantastic deck! 04/08/2016 UPDATE - Hello Clark Family! We are happy to report that the king mattress was replaced and repairs were made to the frame. We've had great feedback from guests on the new one! We hope to see you back at iBeach again soon! Ibeach is a precious house. The kitchen amenities were terrific. This is a great house for families. We love this house as we have rented it twice now. The arrangement of the kitchen/living area and deck are great. Only thing I would add is an elevator as the stairs are hard on some of us to manuver. We thoroughly enjoyed our stay at iBeach and hope to stay again. Close access to beach very handy. This house was by far my favorite! What a lovely home and all the decor is just beautiful! I will be booking this house again! The property was unbeleivable. We would definitely stay here again. This house is a dream come true. We were 6 women between 66 and 51 who all wanted our own bed for sleeping without climbing into a bunk top. We got that in this house with one to spare and all were very comfortable. We could have doubled our number and taken some husbands and kids. The house is so airy and is open so all can participate in everything. Beautiful views and peaceful beach. We wanted to stay longer than the 2 nights we had. Close to town and convenient to all activities. Thank you so much for sharing your wonderful home with us. Best "girls" weekend out ever! Great for families and friends too! This is truly a heaven on earth for children and adults both! I will be back again I'm sure. P.S. Oh yes, the deck is to die for! Love this house! Second year to rent Ibeach for spring break. Perfect house for our family. Loved drinking coffee on the deck in the mornings or watch the kids play in the sand. 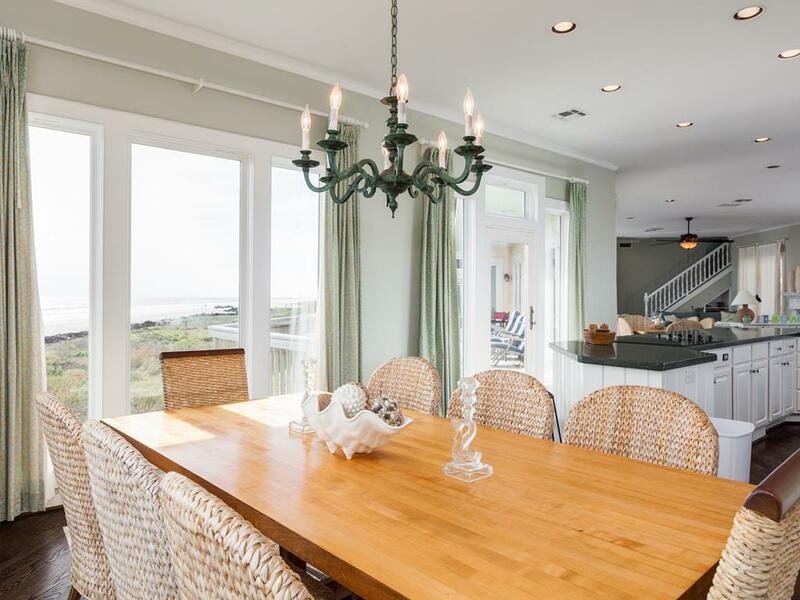 iBeach is a great house for family and friends to gather. 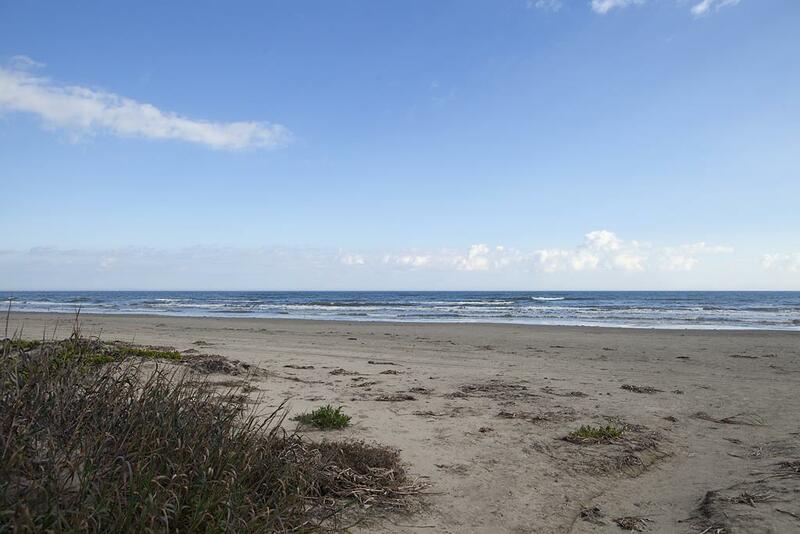 It is locate right on the beach lots of room to run and play for kids of all ages. 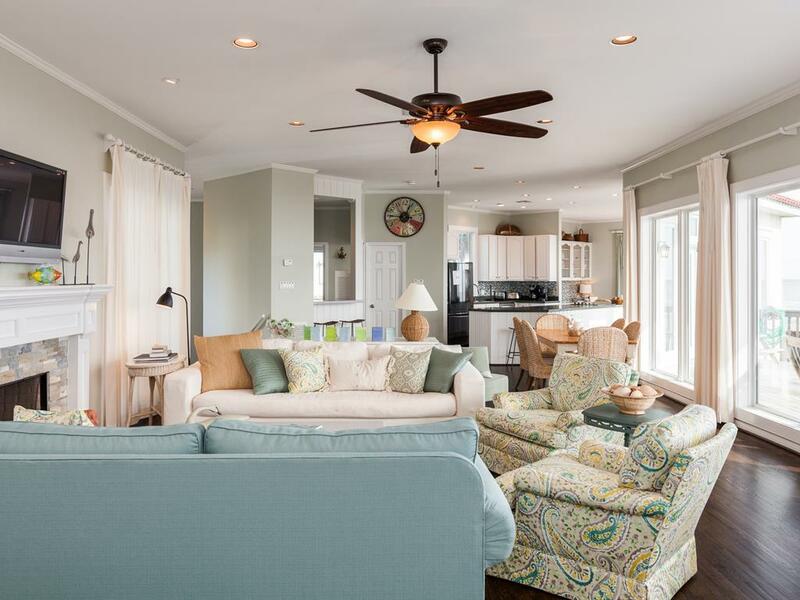 The living area is wide open so plenty of room to play games, socialize, or sit back and read a great book. Very nicely appointed. The bedrooms are a nice size and each bedroom has a bathroom. We had a wonderful family reunion and hope stay in iBeach again next time we go to Galveston. 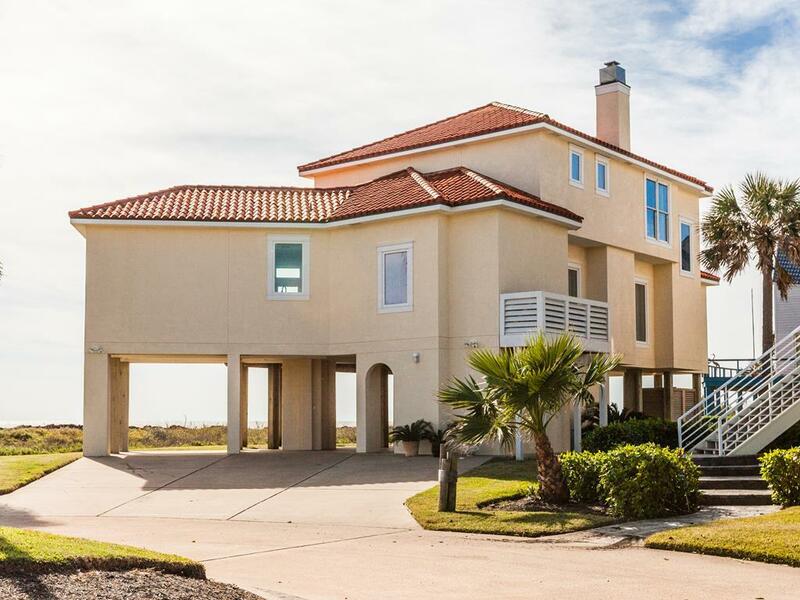 Great house with nice layout and views of the Gulf. What a fantastic beach house! When you sit on the enormous balcony, you are so close to the beach that you feel as though you are sitting on the sand. 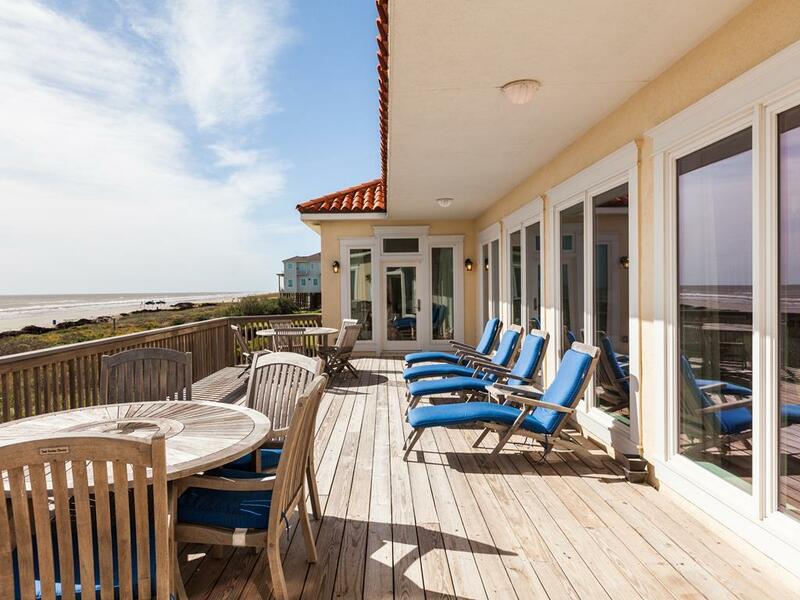 The house is perfectly designed to have great views of the Gulf from every room. 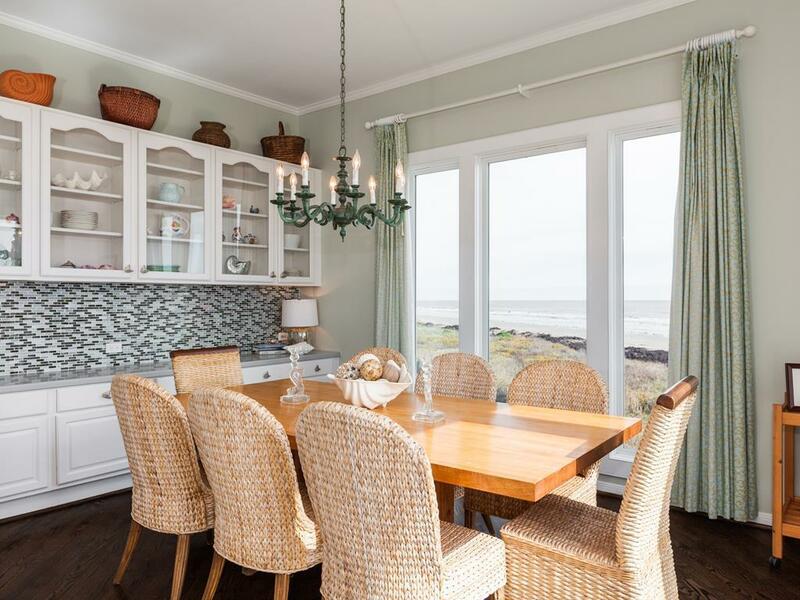 The large kitchen, eating areas and den, all with views of the beach, were great for hanging out, cooking and relaxing. 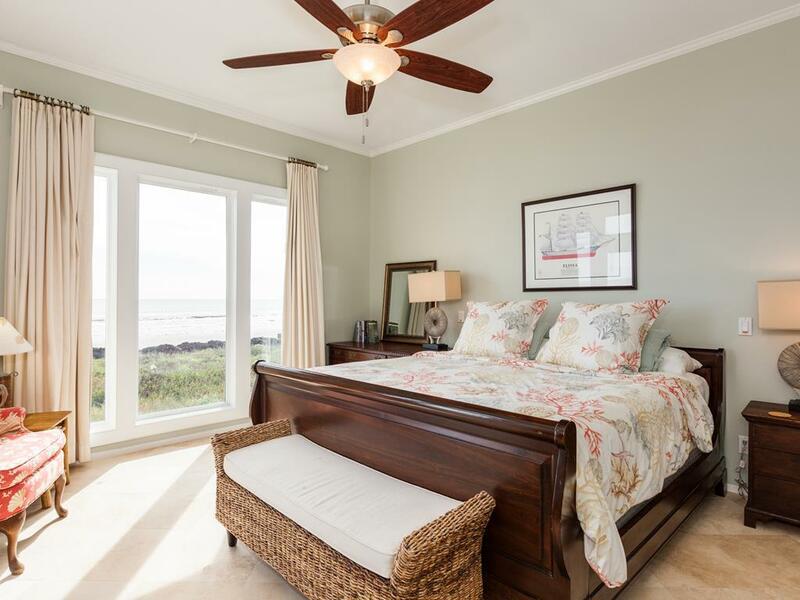 The Master bedroom with the king sized bed and access to the outdoor patio was so comfortable, and so close to the beach you could hear the waves crashing. 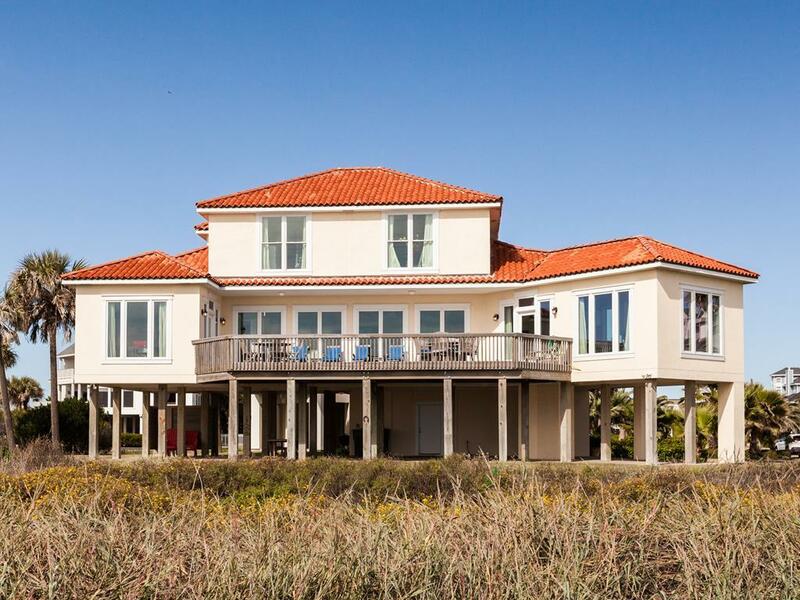 The way this large house is designed it provides complete privacy and views of the beach in all directions. I will never stay anywhere else when we vacation in Galveston. The water is beautiful, the beach is accessible, and the view is exactly what I hoped for, you can see for miles. The sun is on the deck in the morning but behind the deck in the late afternoon. iBeach was a wonderful beach local (RIGHT ON THE BEACH!) for my Girls Week get away. 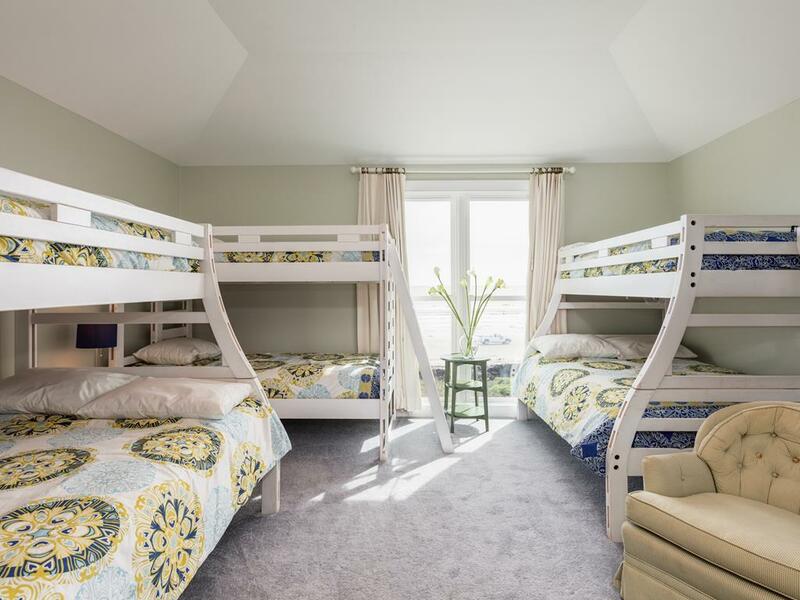 The house slept 10 adults without "bunking up" -- not everyone travels with kiddos! :-) The kitchen/living areas are big enough for everyone to be together without being on top of each. 5 bathrooms ensure everyone gets showered and ready in a timely manner! All in all a great location - proably too big for me to revisit anytime soon but would defintely go back. 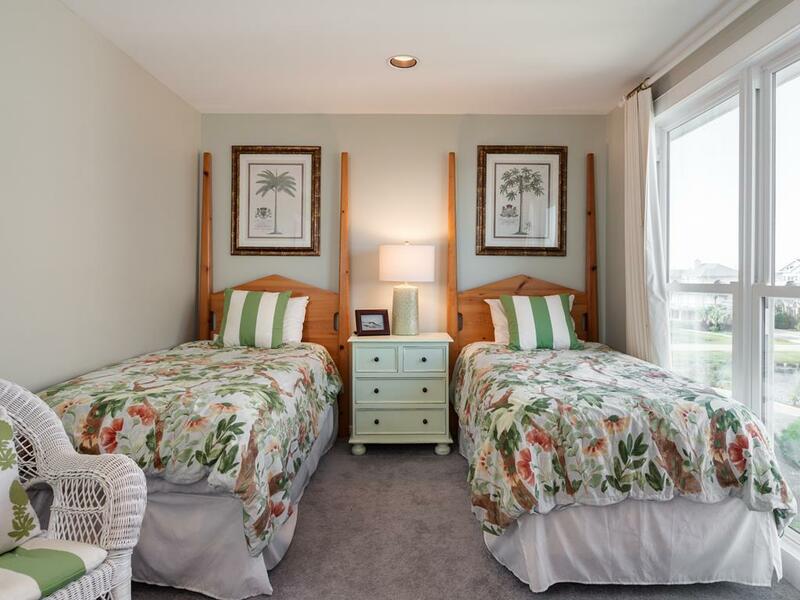 Great family getaway with perfect access to the beach and wonderful deck with ocean view for family games, visiting, relaxing.